If you’re into graphic arts on your computer, it’s a likelihood that you’ve picked up a graphics tablet once or twice before. Once reserved for the Illustrator-elite, graphics tablets have over the past few years made their way out of the professional deep end and into the hands of younger and more able hands. Wacom have been leading the way for years and their Graphire and Bamboo series of tablets certainly help to push the digitizer device in the less expensive areas of graphic tablet selection. One company you might not have heard of are also sticking their fingers in the pie: Genius. The very portable & budget friendly Genius F350 tablet. A company known for their mice, joysticks, and other input peripherals back in the day – when computers were still cementing themselves as devices we would all be using permanently – now sit in the market with inexpensive gadgets that can fare just as well as their high-priced brothers. 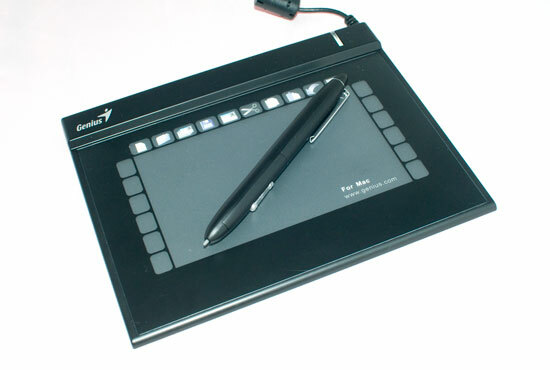 The Genius F350 is a graphics tablet that follows the widescreen format. Designed with today’s newer screens in mind, users will get a drawing space of 3 by 5 inches (3×5″) as well as a series of macro squares adorning the frame that makes up the drawing space. Unlike many tablets, the F350 has size on its good side as it seems like a tablet that’s been on a diet. There’s not much thickness as this little thing only has a slight bump around the top where the cable comes out before becoming just a few millimeters thick for the rest of the unit..
There’s not a lot more to the F350 and that’s a good thing. The slim profile has a flap with a sort of windowed guide that you can pull up & slip things beneath, allowing you to put printed shortcut pieces made for Windows XP, Windows Vista, and Mac OS X for easy access. This allows you – once the drivers are all installed – to use shortcuts just by clicking on each of the little shortcut boxes that decorate the frame of the main tablet. There’s also 1024 levels of pressure and – depending on the application you end up using – you will see the difference in various tools. The pen sadly lacks a rubber on the back but considering the cost, this will hardly be an issue. Other than that, you can use the three-by-five inch window to draw or write as you please or just use the pen as if it were a mouse. Because a mouse isn’t provided, you’re stuck with using whatever mouse you were using in the first place or the pen as the mouse. The pen is very much like a cheap ballpoint pen complete with the pen refills in case you wear down the tips of the pen stylus. 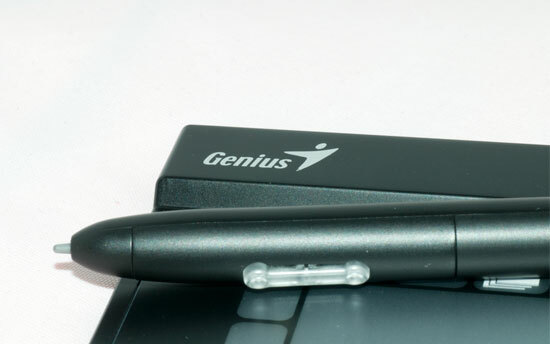 Running off of a single AAA battery, you can use the right click button on the side of the pen if needed, but if you want to erase anything, you’ll need to do it in software because the pen that the Genius F350 comes with lacks a rubber on the back like many of its competitors do. Mind you, the F350 is a fair bit cheaper than what it competes against so this is something that’s easily forgivable. It also comes with Corel PhotoImpact, Power Presenter RE, OfficeInk, and FreeNotes as software and more or less plugs in (and works) straight out of the box. 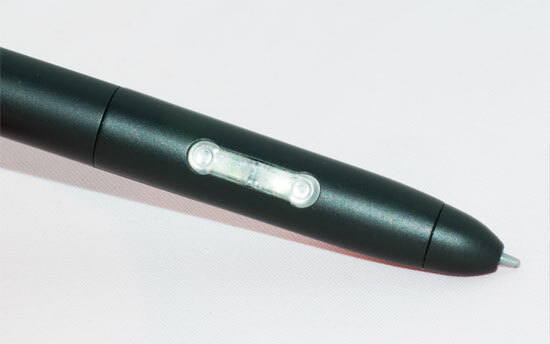 The Genius G-Pen F350 close-up. Overall, the Genius F350 provides a great tablet solution for people not looking to spend a whole lot of money. At a cost of around $50 Australian dollars, you get a decent little widescreen-centric tablet for not a lot of dosh. If you’re after something good for the kids or anyone looking to get into graphics for not much cash, the Genius F350 could well be the tablet you’re after. How much does it cost on Php?